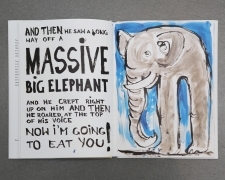 The Danish artist Asger Jorn (1914-1973) wrote and drew "Troels Jorn's Book about the Hungry Lion, the Happy Elephant, the Little Mouse and Jens pissant" for his son Troels Jorn (born 1945) in the winter of 1949/1950. It was a gift from afar for his youngest, as at this time he was no longer living with his wife, Kirsten Lyngborg, and their three children. Troels Jorn's Book, published for the first time in English, is both a picture book for children and an artist's book. In order to preserve this special character Danish version, with modifications to some letters to the German version in the edition at hand. Jorn's unique "visual thinking," in which language, writing and images are inseparably connected.